When it comes to off-roading, there are a number of upgrades that can be added to your vehicle to gain additional traction. For those areas where mud and rocks are plentiful, a mud-terrain tire is highly recommended. If the terrain is especially rocky, steep, or otherwise hinderful, a driver also has the option of reducing the air pressure in the vehicle’s tires. This lower pressure allows the tire to deflate and spread in width, increases the rubber footprint and provides greater traction as the increased surface area allows the tire to better conform to the terrain over which it travels. This technique is known as “airing down” in the off-roading community and is a common practice among its members. There are a few down sides to airing down, however, that should be kept in mind before using this approach to gain traction. Tires that run air pressure below that of the manufacturer’s safety specifications for daily street travel are more prone to sudden air loss, heat build-up, and slipping on the rim. In a worst case scenario, the tire can actually slip a bead, dislodging itself from the wheel rim entirely. This can be a disaster at higher speeds for obvious reasons, and is one of the main reasons why vehicle speeds should never exceed 20 miles per hour if you plan to air down below the recommended pressure. But even at low speeds, the same down sides still exist. Slipping a bead can make for a frustrating day if you’re stuck out in the field without the proper tools to remount and re-inflate. It was for all these reasons and more, that the beadlock was developed. Depending on the application, there are several types of beadlock design. The most common application is a single beadlock design, comprised of a metal ring that mounts to the outer wheel rim using a series of bolts, pinching the tire bead between itself and the outer rim. The older, less expensive versions of this design made centering the tire difficult, were prone to air loss, and had to be re-torqued on a regular basis. The current versions offered are a bit more expensive but much more reliable than their older, less expensive counterparts. The only real issue with using the outer ring approach is that it only provides protection for the outer rim. The inner rim is still vulnerable to bead slippage. Anyone looking for a dual beadlock design to protect both beads should probably invest in an internal beadlocking system. There are two manufacturers that come to mind when discussing internal beadlocks: Staun and Hutchinson. Staun’s internal beadlock is a bladder design that can be inserted into any tire and rim combination. As cons go, the Staun beadlock system requires drilling your rims and adding a secondary valve stem to inflate the beadlock itself. And although it’s not a frequently occurring event, the Staun bladders have also been known to tear or rupture on occasion. Hutchinson’s beadlock system uses a hard rubber ring, not unlike a chunk of conveyor belt, instead of an air bladder. This means no drilling or extra valves are required and there’s no chance of bladder failures. Hutchinson’s primary downfall, besides the price, is that it’s sold as a complete system comprised of a proprietary two piece rim and internal beadlock. So if you’re looking at using your existing rims or any other non-Hutchinson wheels, you’ll have to consider a different system. For a combination of reasons, I selected the Hutchinson Rock Monster as my beadlocking system for the FJ Cruiser. I’ve been running this setup for a little over two years now and have not had a single issue to complain about. Although it does take a bit of time to assemble and disassemble these rims, the process is such that nearly anyone can mount and dismount their own tires. For those of you who prefer to do things yourself to ensure it’s done correctly, this is a great solution. The next two portions of the article will cover the details for mounting your tires on the Rock Monster wheels, as well as the complete disassembly of the Rock Monster wheels so you can easily reverse the process when you need to swap your tires out. Keep in mind that (as of 2009) Hutchinson offers two separate internal beadlocks. The width of each beadlock model varies, so which one you order will depend on the tire you plan to mount. Due to some recent balance issues and general reduction in traction, I decided it was time to replace my Interco TrXus Mud Terrain tires, which of course required disassembling the Rock Monster wheels. I realize it’s somewhat out of order but the videos below begin with the disassembling steps first, explaining the tools required, etc. If you’re just purchasing these wheels and are looking for steps on how to assemble the Rock Monsters, you can probably skip ahead to those steps below. The only real difference is that with existing rims, you will need to clean up the rims before re-assembling, as the tire rubber tends to build up a residue around the inner wheel rim. This first video covers the basic tools, to include the most important item, a set of Tyre Pliers for breaking the tire beads, along with a larger ball peen hammer, torque wrench, 19mm deep socket and a bucket of soapy water and brush for application. I’d like to apologize up front for the wind noise and low volume in the videos. It didn’t seem that windy outside but the camera’s mic is apparently a lot more sensitive than my ears. Also, I use the term valve stem throughout the videos generically. To be completely technical, the portion that gets removed during the air down process (prior to disassembly) is the valve stem core. The stem remains intact. 😉 Lastly, once the valve stem core has been completely removed and there’s no pressure in the tire, there’s no particular need to leave the starter lug nuts in place while removing the rest of the lug nuts. With no air in the tire, all lug nuts can be safely removed in any order you wish. So without further ado, let’s dive into the Rock Monster disassembly process. As I mentioned previously, re-assembling the Rock Monster wheels is something that virtually anyone can do. It does require some patience however, in order to ensure that everything goes back together as expected. The videos below outline all of the basic requirements for re-assembly to include cleaning your wheels, o-ring replacement, lug nut torque and wheel pressure specs and re-inflation. 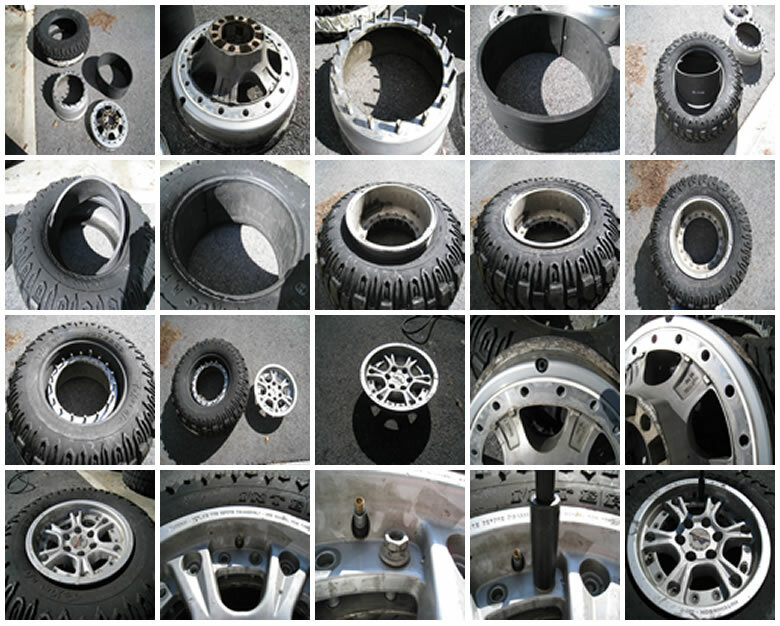 For safety reasons and to ensure your (re)mounting process goes as smoothly as possible, I recommend viewing all of the videos prior to assembling your Rock Monster wheels and tires. From my own experience, having to repeat this process over because of an unexpected air leak can be quite frustrating. Hopefully, the videos will help save you time in the long run. Also, one important note before diving in, I’d like to reverse my recommendation to use Vaseline on your o-rings during this process. I recommended doing so in the video based on Hutchinson’s recommendations and a few of their vendors. I applied a Vaseline product to my o-ring before assembling only to find massive air leaks at the end of the assembly. When I disassembled, the o-ring had literally been eaten away by the product. I’m not sure if all products will react this way but just to be on the safe side I’m now recommending that you keep your o-rings completely dry and free of debris during the assembly process. If re-assembling your wheels after long-term use, make sure your inner rims and other mating surfaces are free of rubber residue and other debris. Use a light scrub pad for cleaning to avoid scoring or marring the surfaces. During re-assembly, ensure that your o-ring remains in its channel. If it snaps out there’s a good chance you’ll ruin it while torquing down the nuts. When torquing your lug nuts, work in a star pattern, torquing each nut to 60 foot pounds. After all nuts are at 60 foot pounds, repeat this process, torquing each nut to 80 foot pounds. Do not pressurize your tires over 60 psi. Rock Monster specs indicate a max psi of 60 pounds. The use of a tire inflation cage is highly recommended to ensure safe re-inflation of any split rim wheel. Make sure you stand to the side, 90 degrees from the wheel face to avoid potential projectiles. For the same reason, use a clip-on style air hose to avoid having your hands or body anywhere near the rims during inflation. If anyone has any questions or comments about these wheels or the assembly / disassembly process, please fee free to leave me a comment below. I’d be more than happy to provide any information I can. If you’re looking for more details on this wheel or want to find out where you can purchase a set, check out my initial review of the wheel here. That being said, let’s begin the (re)assembly steps involved with Hutchinson’s Rock Monster dual beadlock system below. Thanks for the feedback, Waldemar. Glad to hear the videos helped. Thanks for the info, now I can go mount my wheels.